America's newest stage race is already shaping up into one of the premiere stage races on the worldwide racing calendar. The first teams to sign on for the seven-day stage race in August are: BMC Racing, Garmin-Cervelo, HTC-Highroad, Liquigas-Cannondale and Team RadioShack. It comes as little surprise that among the first teams to be announced, all four U.S.-based UCI ProTeams are included. All are sure to bring a first-class lineup as they race in front of home crowds in late August. The only non-U.S. team in the announcement, Liquigas-Cannondale, has recently bolstered its roster with two Americans, Ted King and Tim Duggan, who, as it stands, have a good chance of making the team's roster as its lone American representatives. While only five teams have been announced thus far, competition for the remaining 11 slots is sure to be fierce. "We have had so many ProTour and ProContinental teams lining up to compete in Colorado next year," said Jim Birrell, Managing Partner of Medalist Sports, race organizers for the Quiznos Pro Challenge as well as the Amgen Tour of California. "Signing teams of this caliber is a key indication that the Quiznos Pro Challenge will be one of the preeminent professional cycling events in the world." Just how many American UCI ProContinental and Continental squads will be in the mix come August 21st, is still to be decided, but if the Amgen Tour of California is any example, expect several of these domestic teams to animate the race as they try and prove themselves alongside the best teams in the ProTour. "We want to make sure we have the best riders represented at the race, but we also want to make sure we have the best domestic riders as well," said Quiznos Pro Challenge publicist Michael Haas. 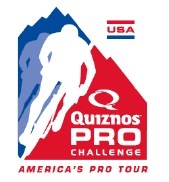 As a UCI 2.1 race, only half of the teams in The Quiznos Pro Challenge may be comprised of UCI ProTeams. The UCI also dictates that 2.1-designated races must have a minimum of least five international teams. The remaining teams will ostensibly be drawn from a quickly expanding pool of domestic ProContinental and Continental teams. In any case, the first five team selections promise to make for an impressive peloton as world-class stage racing returns to Colorado after a 23-year hiatus.